· UK residential development land values saw their third quarterly rise in a row in Q4 2009. 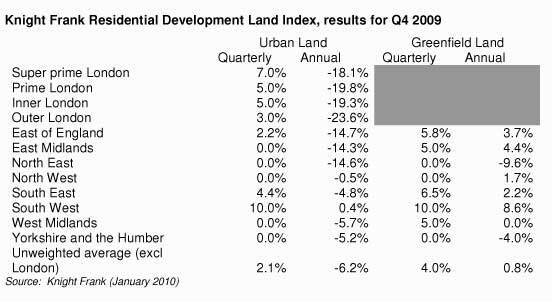 · Urban land values rose 2.1% in Q4 2009, and are now 6.1% higher than the low point they reached in Q1 2009. · Greenfield land values rose 4.0% in Q4 2009, and are now 8.0% higher than the low point they reached in Q1 2009. · Despite strong recent growth, urban land values are still 51% below the peak levels (reached in Q4 2007) and Greenfield values are 39% below their peak. Liam Bailey, Knight Frank’s head of residential research commented: “The strong price performance delivered by development land in Q4 reflects the recovery we saw in the wider residential market during 2009. With UK house prices recovering - by 6% across the year and sales volumes picking up (by 75% year-on-year in December) – development economics have improved and developers and house-builders have been looking to raise new-build starts. “Starts rose over 2009 and by Q4 were running at 25% above the level achieved in the same period a year earlier. However, while the development sector has become more active, the supply of land in the market is still painfully thin. “We estimate that demand for land rose by 20% in Q4 compared to Q3; a significant amount of this new demand is from the house-builders who are back in the market. At the same time supply of land for sale fell marginally (by around 5%) over the same period. Even land that is coming to the market tends to have too high a price placed on it by ambitious vendors. So even though land prices have risen it is very easy for sellers to price themselves out of the market. “Outside of London and the south east the market is still more subdued. Purchaser's ability to make offers with "lump sum" up front payments is still very much restricted and it is only a small handful of cash rich purchasers looking at distressed situations who have been able to do this. “Our outlook for 2010 is for further growth in development land pricing, although we would expect single digit growth for the year. Even this will only take land values part way back to the peak levels they hit in late 2007. The incentive for many landowners to sit out the recovery phase in land pricing will be great, and to my mind will keep land volumes low into the medium term. “Potential new planning legislation following the election could also add to the hiatus in the land market – further constraining supply from landowners and putting additional upwards pressure on development land. Ian Marris, Knight Frank’s head of London residential development added: “Investors started to identify opportunities in the land market in the spring of 2009, however most were held back by the general moratorium, by lenders, on all speculative development opportunities. This trend remains but we starting to see some potential for easing over the coming months albeit on extremely cautious terms.